“Those sad eyes/that sad expression, the sad mustache, the miraculous godly hair, and that messy hair, all of it has deeply captivated me.” …Recently, a very hot/popular beggar post has become famous on the internet, the post narrating what netizens have hailed as “The Ultimate Gorgeous #1 Passerby Handsome Guy” beggar. Owing to his unconventional, nondescript appearance as well as his original “mashup”, netizens have begun following him, even “human flesh searching” him. Tianya calls him “犀利哥”, xīlì gē, “Brother Sharp” or “Sharp Brother”. Wow, he is really handsome~~how did he sink to living on the streets?? Call for a human flesh search! I heard that many beggars are guilty of a major crime running from the law, becoming beggars to conceal their identity. If this guy is unfortunately one of them, and his photograph is posted on the internet, will he be in danger? go pursue a career in Japan. China truly has innumerable handsome guys, Brother Sharp, you are truly too handsome. as expected no one is perfect. He doesn’t really look like a beggar, more like a vagabond. The quality of this person’s tops are all not bad, a down jacket, cotton jacket, even a leather jacket inside, and though they’re a bit dirty, they’re all in good condition, not the kind that beggars find from the trash. That photo of him walking is indeed very handsome, very Japanese or Korean [style]. And some are like a Hong Kong actor. Except…except I still have a little psychological reservation against dirty men…so…please be sure to…wash yourself clean and make yourself presentable before going out!!! Ai yo! My little heart! Beg a talent scout to go find him [to become an actor]…for the benefit of the masses. 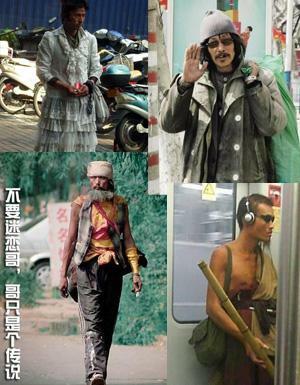 Many netizens have sent me messages asking me to verify whether that latest famous handsome guy begger is really a beggar. Here I will testify that it can be said that he is. Long ago in 2008 I encountered him. Most people who see him will avoid him, treating him as a beggar and the link, but actually this is not accurate. 乞丐 [qǐgài “beggar”] in our country’s ancient words first appeared as a monosyllabic word. The meaning of 乞 [qǐ] in the golden texts was “to beg”. But he does not beg, nor does he know how to beg, because he has psychological problems (in Ningbo they call it “great fog sickness”). They do not have an identity, they do not have family, they’ve even forgotten who they are. They are a group of people abandoned by society, and their final outcome is to die without anyone inquiring about them. They wander in the space between humans and animals. Help them a bit and they become humans, ignore them and they are animals. When I first met him, he was picking up discarded cigarettes to smoke again. I asked him: Hungry? He said: Hungry. I again asked: Here’s 10 yuan, do you know how to go buy something to eat by yourself? (I wanted to test his ability to take care of himself) He said: Okay. 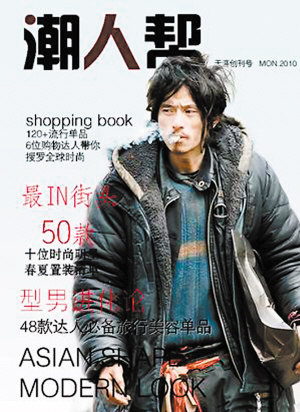 With the 10 yuan, he then purchased a pack of cigarettes at a small shop nearby. I asked: Isn’t your stomach was hungry? Why didn’t you buy something to eat? He pointed at a trash can, then pointed at his stomach. At the time, I did not understand, thinking he was able to pick trash to exchange for food [sort trash for recyclable items to exchange for money]. However later, I saw a scene that broke my heart. Only when spending time with him in later days did I understand why he likes to wear women’s clothes. Maybe you will say: Male deviant, simply perverted, simply likes women’s clothes. You will only be partially right, as the real reason is his heart yearns for a home, a woman to take care of him, love him. Sometimes he is himself, and sometimes he pretends to be the woman that loves him. Every time I find him, I will always give him 10 yuan. And he always goes to buy a pack of cigarettes. He has many sets of women’s clothes, all picked out from piles of trash. People will ask: Aside from smoking, how does he solve his food problem if he also does not know to beg? The below pictures are of him finding things to eat. I hope your ability to stomach things is stronger than my old cat. In front of the door to a flower shop, the ground has discarded food discarded by the florist (I despise this flower shop’s disgusting behavior of discarding refuse in front of its door, ruining the public sanitation, and on rainy days the oil makes it easy for pedestrians to slip and fall). Seeing that there is still a small piece of meat on the ground, he squats down to pick it up to eat. At this moment, my heart cried. These people who truly need our attention have instead been ruined by a bunch of beggars and cheats/con-artists. Since they already are unable to tell the difference between what is real and what is fake, they might as well close the door on love. Today, the reason I spent half a year’s time to investigate and experience their lives is to wake up everyone’s caring hearts, so that we will go help them, so they can become a meaningful person. Turning around again to look at the stuff on the ground, this is stuff even a dog would not eat (these days there are people who treat dogs better than people), and I don’t know why I thought of something that was once written: Behind red doors food go to waste, while frozen bones lie on the streets. His road may be very long or it may be very short. What his future will be like I do not know. 2010 March 2 UPDATE: Here are two videos spreading on Kaixin001 about Brother Sharp. 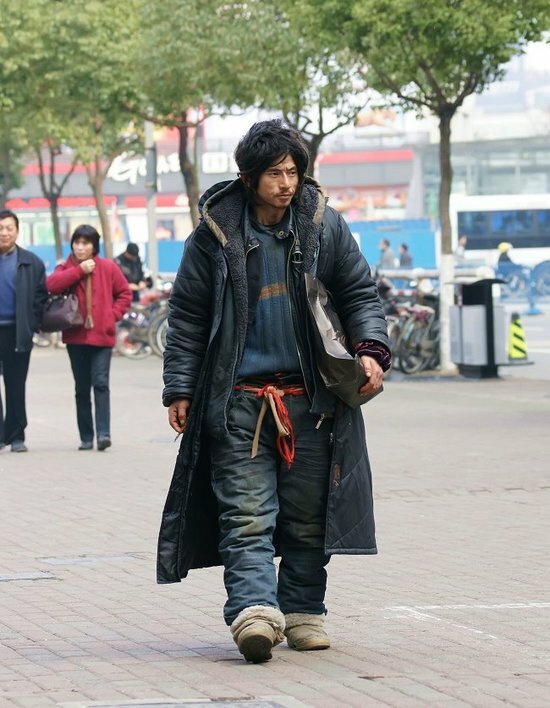 Because he had become popular on the internet, many people went to go find him, asking him where he is from, offering to help him go back home (to his hometown or family), or help him find work. However, this frightened him and he would only cry without speaking. Someone to love you. chinaSMACK personals. Thank you for using our translations, Clifford Coonan in Beijing.